Click here to view the Loren Hope Fall ’12 look book that I participated in. You look stunning!! Wonderful dress and necklace! Love this look! Love the jacket! I love the jewelry. The maxi and jacket look great together too! What a great fall look. Lovely Fall outfit! The dress and jacket are great together! We both love every aspect of this outfit! The color of this dress is gorgeous and we love your shoes! Jewel tones look great on you :-) That necklace is super cute! wow, you look wonderful and i love your hair in this post! also, the color is amazing! What a perfect fall outfit! Adore the dress, the color is simply gorgeous on you! I love these darker colors on you!! Lovely tone and amazing jewelry!! Way out of my price range, but I looove that necklace! gorgeous, love that deep [purple color on you! Adore every little aspect of this outfit. The color on this dress is stunning. Love the necklace! Looks great with this dress! You look stunning! I love that color on you! this outfit blows my mind-i love everything from the colors to the jacket, the dress, jewelry, and how perfectly your prada bag complements it (and pretty much every outfit you wear). absolutely love it! Beautiful dress, absolutely love the color! What a great outfit! Really loving this look on you! Adore the color of the dress. Great outfit. i just bought a VERY plain LONG ballerina-esque maxi from anthro that is just BEGGING to be styled with some statement pieces like this!!! checking out the lookbook now. you look gorge as always! That wine color is very pretty on you! And I love the bright statement necklace. Such a great colour on you pretty girl! Beautiful outfit! Perfect for fall. You look absolutely gorgeous! I love the dress and the jacket is just amazing. Gorgeous look! I love the color of your dress, so pretty. Love the colour on you! So good! What a great color on you! Looks fantastic! you look perfectly polished and put together here. adore the necklace and purse. This look is amazing! Love your jewels and adooore your bag! I absolutely adore this look! The dress is just beautiful! The color of this dress is stunning on you and I am mesmerized by this necklace! OH my goodness, the color, the hair, the jewelry…everything! What a great maxi dress transition into fall! Love it and think I’ll have to try something similar. You forgot the “Lips” details… I am looking for a lip colour similar to yours! Love the colors of this outfit!! 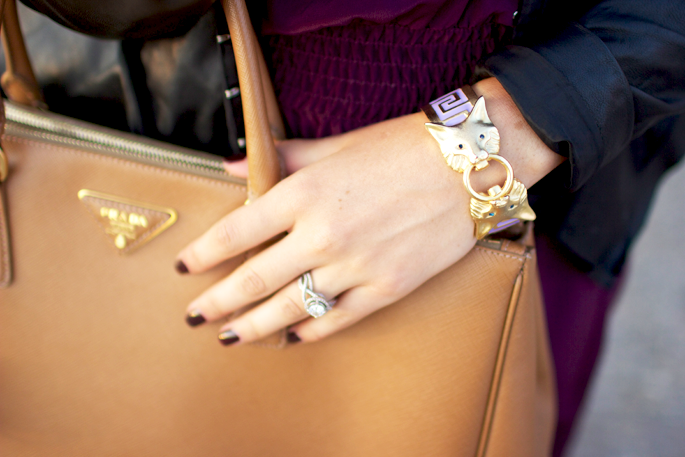 That fox bracelet is too cute! Love the dress and the jacket. Plus, that bracelet is to die for! Definitely love jewel tones on all women. Perfect look for fall! I’m still dying over those shoes, I just need to go get them. Rachel ~ loving this look! The jewel tones looks so beautiful on you. Great idea on how to style a maxi dress for fall. Love this look! What lip color are you wearing? I’m loving darker, burgundy/berry lips for fall! Thanks! Love this look! What lip color are you wearing? I’m loving darker lips for fall! Thanks! That lip color is so gorgeous with your skin/hair. You look great! You look beautiful! I love this color dress. Love the rich color of the dress, so pretty. You are such a beauty dear! Love your dress and how rich the color is! Beautiful Prada bag!! I love the hue. You look amazing! I’m so loving that bracelet. Such a great look. You look perfect! I adore this dress – the color looks stunning on you! love the bracelet and the dress!lovely look! Beautiful dress and beautiful shoes!!! Love love love your blog! Every outfit is innovative and wonderfully assembled. Love the wine/violet and tan combination (tres fall) and your hair is beautiful! You are such an inspiration! Espectacular y guapísima. Precioso vestido y me encantan los complementos! Love this outfit! The dress is so cute with the jacket. Love that bracelet too! Loving the colors of everything…so perfectly fall! This bracelet is so cute !! Love it! I love the eggplant color of your dress. So in for Fall. I am enjoying reading your blog every morning. TOTALLY in love with the jewelry! Nice one! Love Love Love this look! Fabulous- I think I need those Zara sandals!! LOVE the dress <3 Seriously love looking at your blog! I find it awesome that we met a few months ago! :) I had no idea that you lived by me!